Anything related to this is so important – WhatZupBristol! Cosy pubs are a winter essential, and these ones have open fires to warm your cockles. These toasty London pubs will certainly set you up for a seriously snuggly session this season. Roast dinners optional. Possibly London’s most Instagrammed pub (aside from The Churchill Arms, of course), The Holly Bush is a gorgeous 18th-century pub with a cosy fireplace and lots of delicious, warming food. Find it at 22 Hollymount, Hampstead, NW3 6SG. The Flask in Highgate is a charming 17th Century pub, complete with a gorgeous open fireplace to thaw your toes after a frosty walk. (See also: 5 Gorgeous Winter Walks That End At Lovely London Pubs.) Any thrill-seeking Londoners will be interested to know that ghosts are rumoured to haunt the haunt. Find it at 77 Highgate West Hill, N6 6BU. The Grapes is a traditional English pub, owned by Sir Ian McKellen, with proper ales and a Victorian long bar (and now with the added addition of the original ‘Gandalf staff’ on display behind the bar). There’s a heated terrace at the back that dangles over the Thames and flaunts some great views of the City and it’s also said that Charles Dickens used to dance on the tables in his time. Find it at 76 Narrow Street, Limehouse, E14 8BP. Open after a spiffing new refurb, The Gun is the ideal pub, come rain or shine. 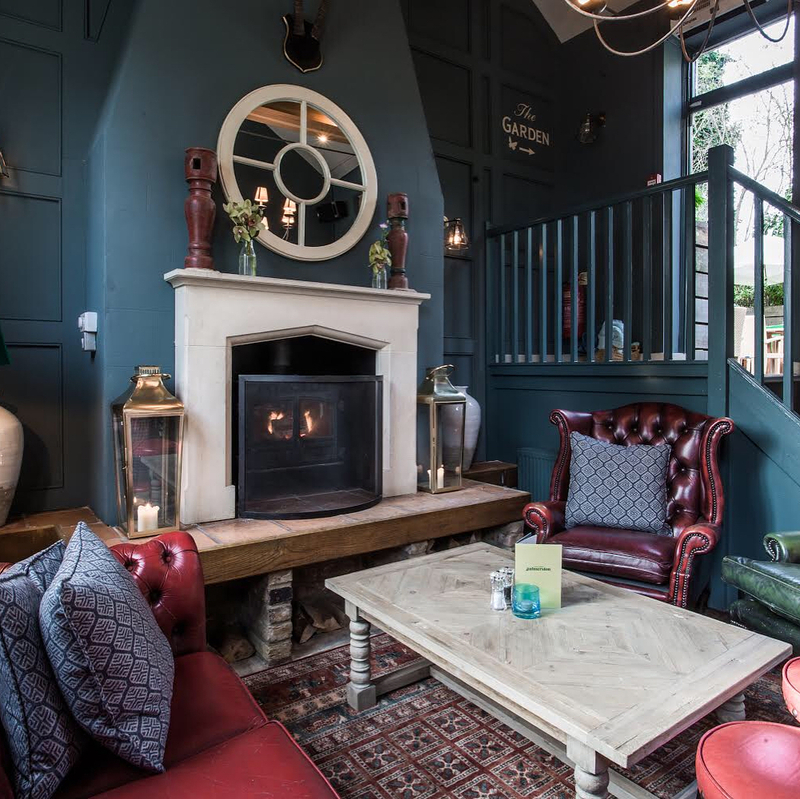 While the outdoor terrace is decked out with giant Jenga, Connect Four and a beautiful gin garden, the inside is kept heated by the roaring fire, as well as its fantastic, warming food. Find it at 27 Coldharbour, E14 9NS. A Georgian gem, this wisteria covered beauty is the perfect place to escape not only the cold, but also the hustle and bustle of modern life. Log fires, possibly the best Yorkshire puds in London and a village-like feel matched by no others, this pub may well be the snuggliest of all. Find it at 10 Thornhill Road, Islington, N1 1HW. Tucked away between Hammersmith and Baron’s Court, The Pear tree is the quintessential Victorian pub (and one of the oldest buildings in the Hammersmith/Fulham area, dating back to the 1800’s!) With its open fire, tea light-strewn tables, hearty grub and wool blankets, it is the epitome of a perfect winter pub. Find it at 14 Margravine Road, W6 8HJ. 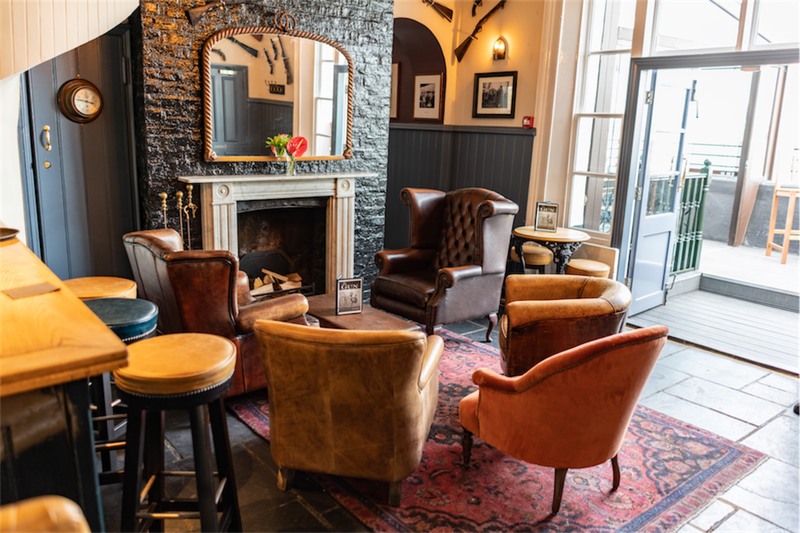 Oozing warmth and charm, this quirky pub has three fires to choose from – a wood fire in the games room and two coal-burners elsewhere. The Antelope offers a whole host of cosy corners, as well as hotchpotch trinkets to keep the eye entertained. Find it at 76 Mitcham Road, London SW17 9NG. This award-winning gastro pub has a real rustic feel with its open fires and wooden tables, presenting itself as more of a living room extension than a North London pub. After a plate of their delicious food, you’ll be full, warm, and happy – it’s almost impossible not to fall fast asleep on those sofas. Find it at 33 Dartmouth Park Hill, NW5 1HU. Even more enticing in winter when its great roaring fires come to life, the Earl Spencer is a much-loved neighbourhood pub that conjures up seriously good seasonal food and an atmosphere second to none. Find it at 260-262 Merton Road, Southfields, SW18 5JL. One of the oldest pubs in London and frequented by literary heroes such as Charles Dickins this adorably antique Fleet Street gem is a hit with both tourists and locals. Serving up simple pub grub and affordable beer (which is really a rare tourist attraction in itself), this cosy old pub is well lit with its roaring fire in the colder months. Find it at 145 Fleet Street, EC4A 2BU. The ideal spot for a Sunday roast, this fairytale cottage-esque pub has a rather large food menu to tempt you in. If that’s not enough, the warm atmosphere created by the open fire place will have you too snug to ever leave. Find it at 19 Park Vista, SE10 9LZ. 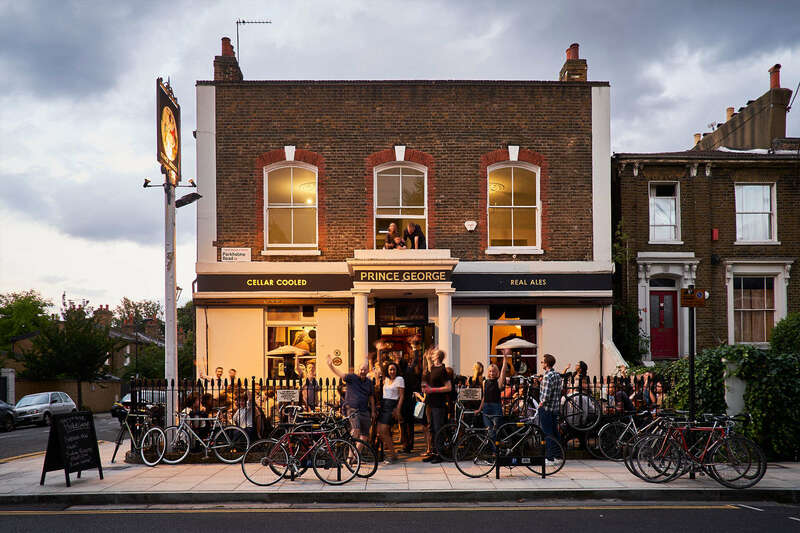 This pubs popularity has risen a lot since gentrification transformed Dalston into one of London’s hippest areas. The shabby-chic decor and edgy electric juke box pull hipsters, students and locals alike to this wateringhole and with the added bonus of an open fireplace it seems that this venue will be hot all year round! Find it at 40 Parkholme Road, E8 3AG. The post 12 Cosy London Pubs With Open Fires To Keep You Toasty This Winter appeared first on Secret London. Next PostNext Who else? <3Bristol ?